The memories page on Facebook has reminded me that I wrote about the Kelpies at Falkirk a year ago today. 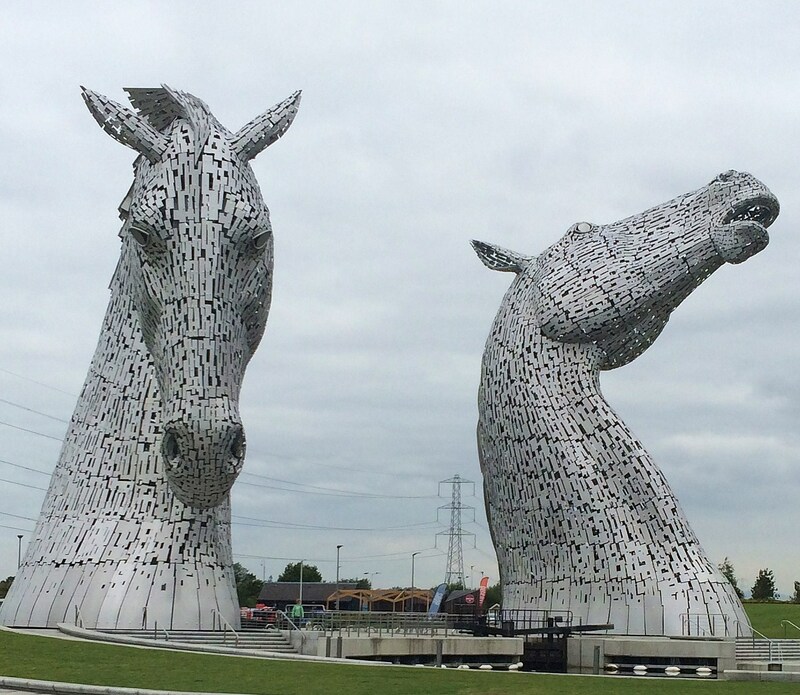 Back then, I had not yet seen them and my notes on them were a postscript to the information on the kelpies as water spirits, not as sculpture. Even though I had written a bit about them, I was not prepared for the experience of seeing them. We drove south on the M9 from Stirling on our way to South Queensferry where we would stay the night after taking the train into Edinburgh and back. It was a quiet Sunday morning; the road was free of heavy traffic and gave plenty of opportunities to enjoy the scenery as we passed by. Suddenly the tops of the heads of the Kelpie sculptures loomed at us from over the treetops to our right. After what seemed like a circuitous route to get off the M9 and back to the Helix where the Kelpies are installed, we were at the car park. A leisurely walk of half of a mile or so through a preserved wetlands area showed us why we had had to drive so far afield, or in this case so far a lagoon, to get there. As we walked, we could not see the Kelpies but enjoyed the swans and the occasional dog out walking its owner. We turned a curve in the path and suddenly they were across the park from us. Bordered by the canal alive with houseboats parked along the edge, the open area in which the Kelpies stand is accessible only by walking across wooden footbridges that cross the canals. It is the hub of 27 kilometers (nearly 17 miles) of walking and biking paths that connect the surrounding sixteen communities. 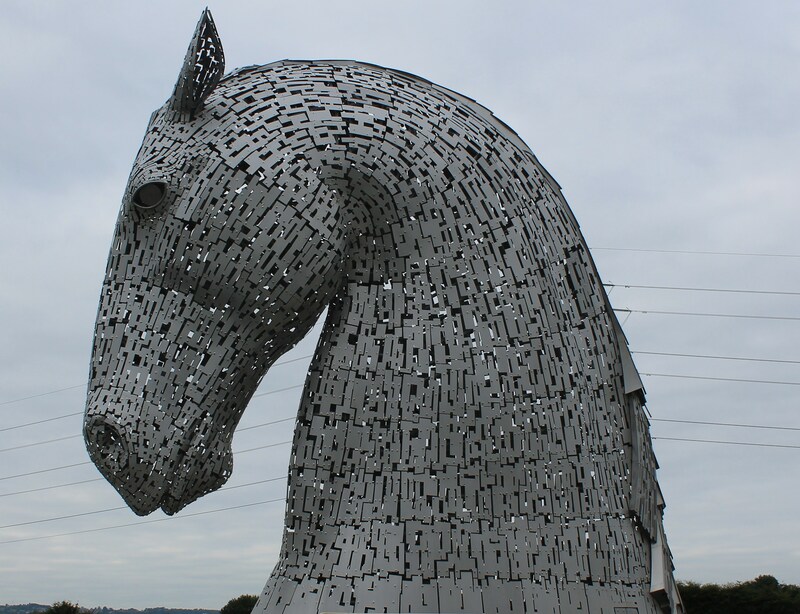 Andy Scott, the sculptor who created the Kelpies, envisioned the classic working horses, the horses that moved goods throughout Scotland. His idea was to pay homage to the great pulling horses: the Percherons, Shires and Clydesdales (two of which were used as the life models for the sculpture). These were the majestic horses that pulled the plows across the fields, the wagons through the roads, and the barges along the canals and rivers. At 30 meters high (98.4 feet) and weighing 300 metric tonnes (nearly 330.7 tons) each, the construction of the Kelpies sculpture was a feat of engineering that was monumentally completed in 90 days. Each one has a base of concrete reinforced with steel weighing in at 1200 metric tonnes (2,656,000 pounds). Nine Hundred small individually cut steel plates were used for each head. I walked around each one of the heads, slowly taking in each and every angle. I was amazed at how full of life they are. They are certainly majestic. Mr. Scott has captured the very essence of the horses and I’m not too sure they don’t come the rest of the way out of the ground and gallop around a bit when no one is looking. 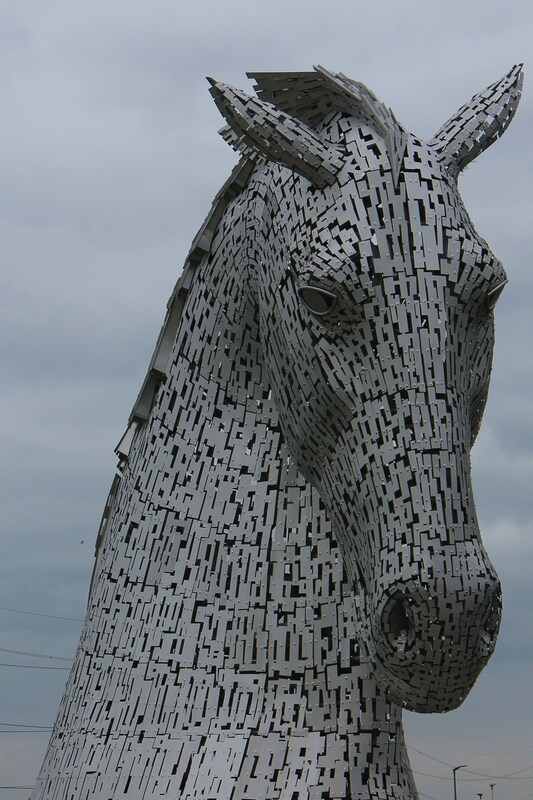 This entry was posted in Ancestry, Eco-travel, Ecology, Scotland and tagged Falkirk Kelpies. Bookmark the permalink.